One of the challenges for a home baker is to try and figure out how to make a great bread once you've tasted it. Like encountering the Platonic ideal, you recognize it, reach for it and try and duplicate it -- and then you fail miserably and often give up. Jim Lahey, the founder of Sullivan Street Bakery, was like a culinary Plato for me. Every bread he turned out was amazing and no matter how hard I tried I couldn't find a way to make the airy, light, wonderfully tasteful bread at home. To learn more, I actually visited his bakery in New York several years ago and did a story on him. And while he gave me a few generous tips in an interview (and critiqued the sample I had in my backpack), it wasn't enough. I had to learn on my own and like most bread, I later realized success was less about the recipe than the technique. Lahey, of course, later caused a storm on the Internet with his no-knead bread recipe, courtesy of Mark Bittman. 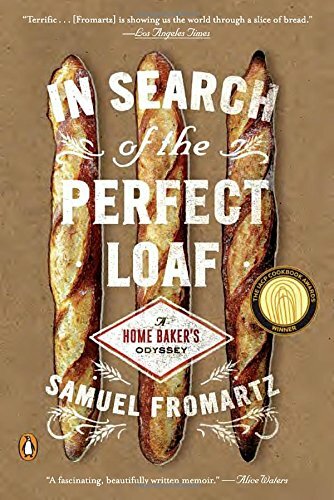 Then, he spun those recipes into My Bread published this past fall, which ranks as a perfect starting point for an aspiring baker. Less known than his bread, however, are his terrific pizzas, which he also includes in the book. These aren't the round pizzas he serves up at his New York restaurant, Company, but rectangular sheets of exceedingly thin-crust pizza, topped with onions, mushrooms or just tomato sauce. They are sold by the slice in his bakery. The big secret about these crispy gems? Like no-knead bread they are dead easy and fast to make. For the effort, you get great results. In fact, the pizza recipe was so easy that I was skeptical it would be worth it. You mix the dough quickly, let it rise for a couple of hours, flatten it out in a rimmed baking sheet with olive oil, spread the topping and bake it. You can dispense with a baking stone, too, since the crust is so thin. And finally, watch your impulse on toppings! The biggest error pizza novices make is to pile on so much stuff the pie turns into a soggy, gloppy mess. As Jim told me many years ago, when it comes to pizza, "less is more." He's right. Like many Italian concoctions, he also avoids cheese on these rectangular pies and the result, in my opinion, is superior. But if you insist, go ahead and add a bit of cheese. Here's his basic dough recipe and the stellar pizza patate (potato pizza). Spread the potato mixture evenly over the dough, going all the way to the edges of the pan; put a bit more of the topping around the edges of the pie, as the outside tends to cook more quickly. Sprinkle evenly with the rosemary. (Note: I left it out in the version pictured above, but feel it's better with it). Recipes reprinted with permission -- and a nod to Yeastspotting. For tips on making the pizza, check out this great video featuring Jim.